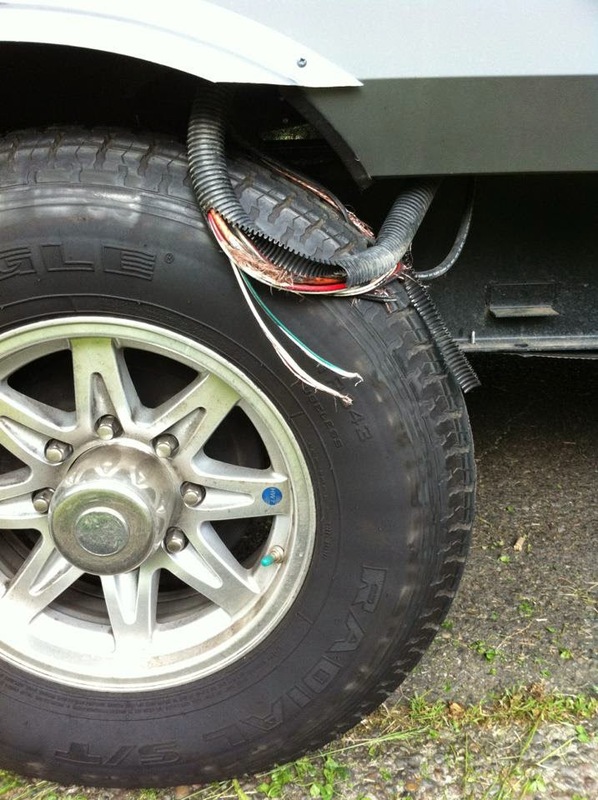 RV Tire Safety: Why are "Blowouts" of special concern to RV owners. Why are "Blowouts" of special concern to RV owners. Here is a video that points out a problem unique to RVs when we are discussing what happens if a tire fails catistrophically. and this picture shows what might happen to your electric wiring. I have made a number of posts on Tire Failure and How to lower the chance of failure, but none of the actions you take can completely prevent a tire failure with 100% certainty. Since RV manufacturers don't have to design or build their product to pass crash or rollover tests as cars do, I have not seen what I would consider a real effort on the part of RV MFG to place electric, fuel or propane lines behind shielding that would protect these potentially dangerous features in the event of an all too often tire failure. So it is up to you, the RV owner, to take all the steps you reasonably can to lower and hopefully avoid the chance of tire failure so you don't have to worry about damaging these other critical components. 1. Know the actual load on each tire. Axles are seldom balanced 50/50 and it is not unusual for the heavy loaded tire to have hundreds of pounds or even a thousand pounds more load than the more lightly loaded tire. 4. Use a TPMS to provide as much warning as possible of an impending tire "Blowout" due to air loss so you can slow down and stop before damage is done to the RV. 5. When inspecting your tires do not simply look at tread wear or sidewall cracking. Look for bulges and out of round conditions or locations of excessive wear that may be indications of potential tire damage that could lead to a tire failure. 6. At least once a year do or have done a "Free-Spin" inspection to help find structural problems with the tire. If you don't have a jack and the proper equipment, have this done at your tire dealer. Tell them you are looking for a separation that would show up as an "out of round or lateral run-out condition." This is much easier on trailers than Motorhomes but it seems that trailers have a higher probability of having this type of failure. Here is an example of a trailer tire that looks OK until it is rotated. You can see the wheel is OK but the tire is clearly no longer round. I had an opportunity to do an autopsy on this out of round tire and confirmed that the belts had separated. You can see the separation in this picture below, that shows the belts are no longer attached to each other. Clearly this is a complete separation waiting to happen but just looking at the tire as it sits on the ground will not make this problem noticeable. I have seen trailer tires actually walking back and forth usually due to worn bushings on the springs, best bet is to have the neoprene type bushings replaced by the ones that can be greased.